When it comes to enjoying the local cuisine on your trip to Athens, Greece, there are two ways you can try one of the region's favorite traditional snacks, gyros. 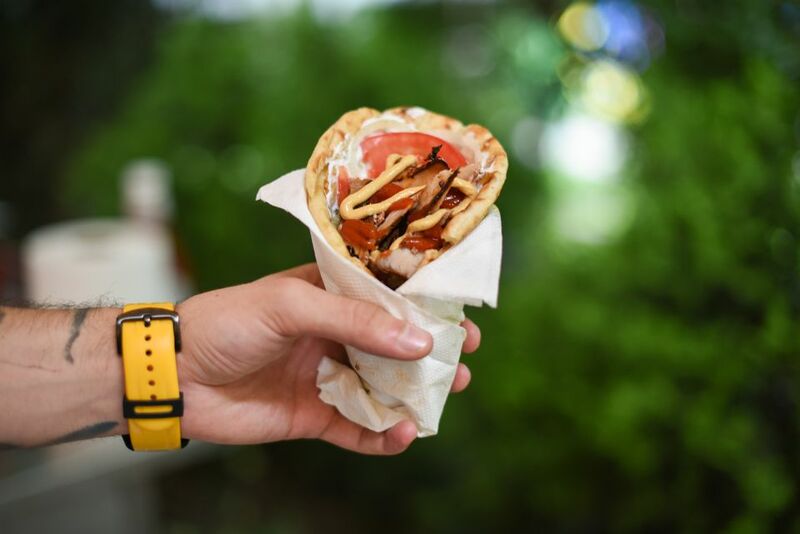 Typically available in a sandwich or wrapped in a pita, gyros originated in Athens in the early 1900s and were already a popular quick meal by the 1960s. In Greek, "gyro" means "wound," which is where this Greek dish gets its name. Although the term originally referred to the intestines of chicken, pork, or lamb that were wound around a spit and broiled on a rotisserie, it has since been used in Greece to refer to the sandwiches themselves or to any meat prepared rotisserie-style. The gyros sandwich or gyros pita is how many travelers will encounter gyros in Greece. These sandwiches are prepared in one of two ways that are both served on pita bread with a dab of garlicky white tzatziki sauce, a few slices of tomato, and a few slices of onion. Gyros may also refer to almost any kind of meat on a spit, cooked until it is crispy on the outside, then either sliced off or delivered in chunks onto a plate; sometimes vegetables are strung with the meat, making it similar to a "shish kabob." Keep in mind that gyro isn't pronounced like a "gyroscope" but rather like "year-oh," so if you're ordering one when you're out, you'll want to make sure to say it correctly. Gyros pita sandwiches are typically served at small specialty shops in many of Greece's major cities offering pick-up meals to-go, but they're also found on the menu at some restaurants and tavernas. Occasionally, mass-market pita shops like Quick Pita will charge an extra table fee if you don't take it to go. The gyros prepared in sandwiches is made in one of two ways. It may be sliced off of a cone of ground meat (typically a combination of lamb and beef), mixed with spices, and formed into a cylindrical shape that slowly rotates on a vertical spit in a rotisserie, crispening the outer layer. On the other hand, gyros could be made from precooked slices of pork assembled into the cylindrical shape and finished by being rotated on a vertical spit until the outer layer is crisp. Both versions are usually served with pita bread, which is just about the only time you will encounter this Middle Eastern bread in Greece. Some places serve it with fries, which will often be popped right into the pita, and the whole thing is usually served wrapped in a waxy paper. You'll want to grab plenty of napkins if you're taking your sandwich to-go as this paper is inadequate to keep the juices and tzatziki sauces from dribbling down your chin and hands. Gyros are a relatively new concept in Greece and elsewhere in the world. The technique for vertical meat grilling used in gyros was originally discovered in Bursa by Turks in the 19th century Ottoman Empire when cooking lamb in what's known as döner kebabs. After World War II, Anatolian and Middle Eastern immigrants brought this food to Athens, where chefs developed their own variation of the style, adding onions and other vegetables to the mix, which eventually became known as gyros. Just under 20 years later, gyros had already spread to the United States cities of Chicago and New York, and by the mid-1970s the first gyros meat mass-production plant was opened in Milwaukee, Minnesota, by John Garlic, who later sold it to Gyros, Inc in Chicago. You can likely find gyros at Greek restaurants around the world, but you can also still find the street cart style service in major U.S cities like Philadelphia, Austin, and Atlanta. What Causes Earthquakes in Greece?